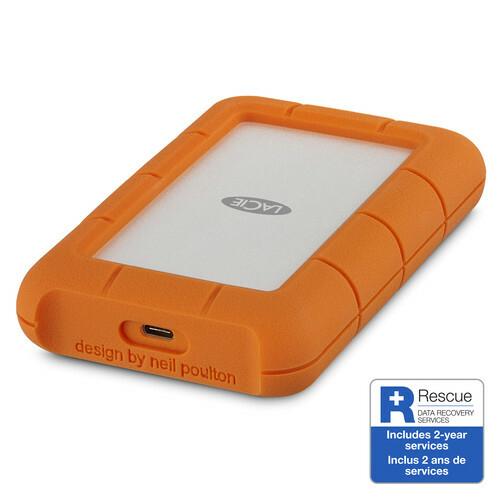 For over a decade, LaCie Rugged® portable hard drives have thrived where only the toughest survive - the film sets, photo shoots, and music studios of the world’s most influential creative pros. Why? Because LaCie Rugged products are the industry’s most trusted way to capture and transport data in the field. Drop, crush, and rain-resistant for all-terrain use, the LaCie Rugged USB 3.0 Type-C External Hard Drive (2TB) combines weathered durability with USB 3.0 Type-C technology that delivers data transfer speeds of up to 130 MB/s. Drop, crush, and rain-resistant for all-terrain use, the 2TB Rugged USB 3.0 Type-C External Hard Drive from LaCie combines weathered durability with USB 3.0 Type-C technology that delivers data transfer speeds of up to 130 MB/s. This drive has been tested with a drop resistance of 4', the crush resistance of a 1-ton car, and water resistance in the rain, all of which will help Windows and Mac users keep their data safe in the event of a mishap. When combined with the Rugged's storage capacity of 2TB, you'll have plenty of room for a variety of files, such as movies, photos, music, and documents. 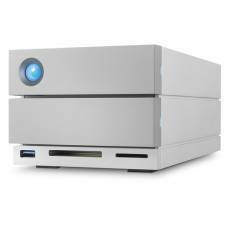 Additionally, this drive can be used as a digital shuttle to transport footage from set to a post-production facility, as well as store large Adobe Lightroom libraries. 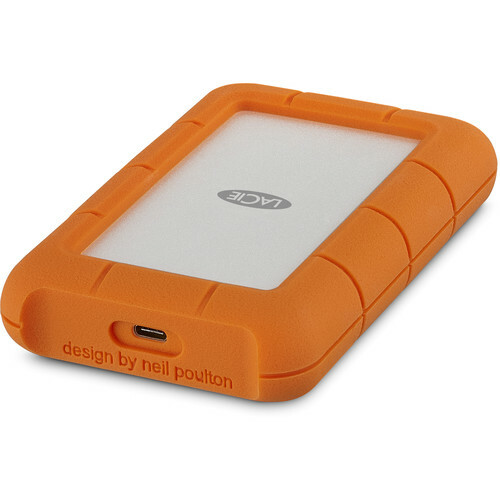 This LaCie Rugged features a 5 Gb/s USB 3.0 interface, which is also known as USB 3.1 Gen 1. While it has been built with a reversible USB Type-C connector, meaning that the included USB Type-C cable can be inserted either right-side-up or upside down, it is also compatible with USB 2.0 at speeds up to 480 Mb/s, while the included USB Type-C to Type-A cable allows compatibility with systems equipped with USB Type-A ports. The drive is bus-powered through its USB cable, meaning that no other external power sources are required for operation, and protection is provided. 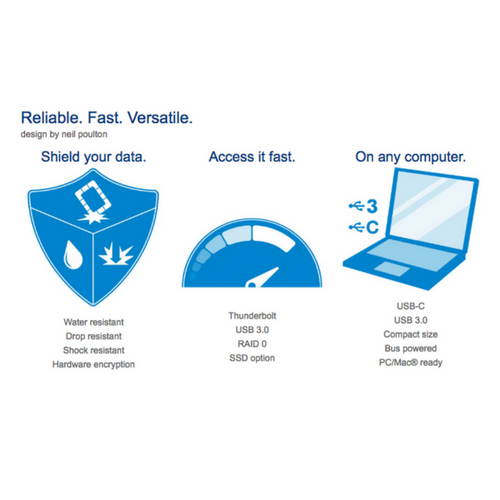 Tough, ready, scalable enterprise-class storage drives for greater peace of mind.